Disney’s Caribbean Beach Resort opened in October of 1988, making it the fourth resort at Walt Disney World, and the first Moderate Resort. The resort features sections named after different Caribbean Islands. The areas are named: Jamaica, Aruba, Barbados, Martinique, Trinidad North, and Trinidad South. Guests staying in Martinique will be closest to Old Port Royale Towne Center, which houses the main pool, gift shop, arcade, Shutters, and Old Port Royale Food Court. Disney’s Caribbean Beach Resort has 7 different pools around property. The feature pool, Fuentes del Morro, is pirate themed and is located in the Old Port Royale courtyard. Fuentes del Morro has a waterslide, hot tub, and a pirate themed children’s play area. Each “island” at Caribbean Beach also has its own leisure pool, which are usually less crowded than the feature pool! Located inside Old Port Royale is Old Port Royale Food Court, Caribbean Beach’s quick-service dining location. They are open for breakfast, lunch, and dinner, and feature different areas where you can grab unique cuisine. There is a bakery, a grab-and-go market, and several different counters where you can grab a burger, salads, pizza, pasta, and more! Check out the full menu here. Shutters at Old Port Royale is Caribbean Beach’s table-service location. Shutters is only open for dinner and the menu features Caribbean fare such as: Island Pasta, Pepperberry-Rubbed Caribbean Pork Ribs, and Ancho-Grilled Beef Rib-Eye, and more! Check out the full menu here. For the shoppers in your family, be sure to check out The Calypso Trading Post and Calypso Straw Market, where you can find souvenirs, gifts, snacks, and any essentials you may have forgotten to pack! Both The Calypso Trading Post and Calypso Straw Market are located inside Old Port Royale. Unique to Disney’s Caribbean Beach Resort are pirate-themed rooms! These rooms are sure to delight the pirate fan in your family with the fun pirate details, like sleeping in a pirate ship bed! One major drawback to these rooms is their location – they are located in Trindad South, which is the furthest from Old Port Royale, and the last bus stop on the line to the theme parks. 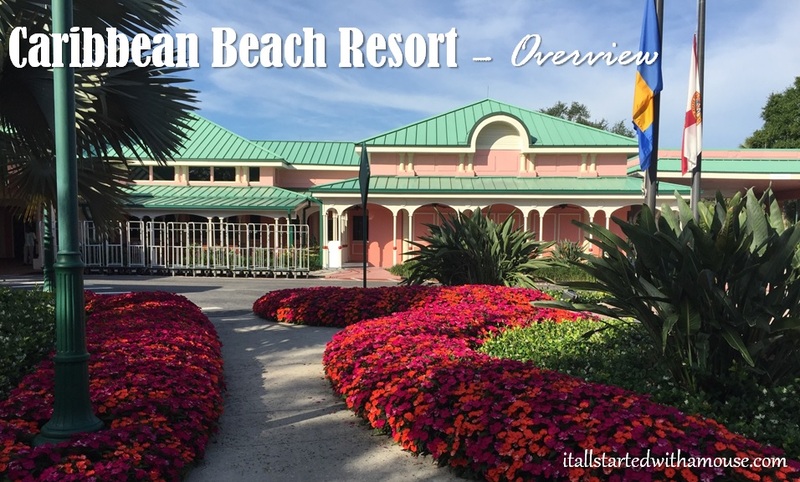 It is important to note that Caribbean Beach is a very large resort, and features an internal bus system to transport guests to other areas of the resort.